This entry was posted in New and Noteworthy Blog on April 10, 2019 by Lauren Pearson. 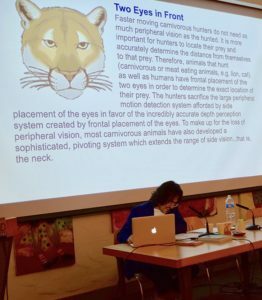 The Art as Critique Conference that took place on Friday, March 1st 2019, arose out of a series of collaborative discussions on the project of maintaining, claiming, and mobilizing art as political critique, as something wrapped up with ongoing global struggle and crisis. The day long symposium was concluded by a joint lecture and discussion with Koyo Kouoh, co-founder of the Senegalese RAW Material Company and recently appointed director of the Zeitz Museum of Contemporary Art Africa, and Vìctor Albarracin, Artistic Director of lugar a dudas. 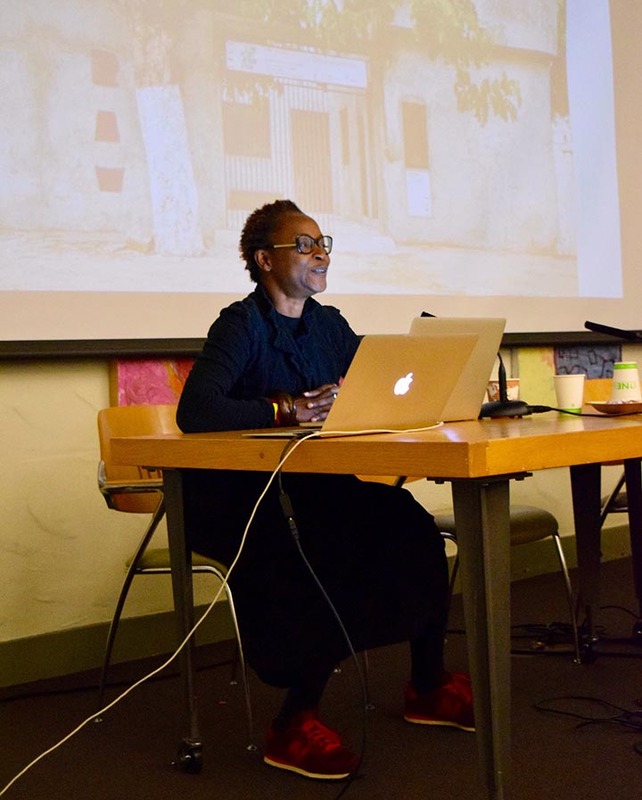 Their lectures addressed resistance to state-sponsored artistic production, anti-colonial curatorial strategies, and the role of the art institution in defining and encapsulating curatorial practice. In response to state-control over art institutions in Senegal, Koyo Kouoh founded the RAW Material Company in 2008. Curatorial practice, she explained during her portion of the joint lecture, is always bound by the limits of an institution, and so the question becomes “How do institutions create the role of ‘curator’?” Naming was very important to Kouoh during the conception of the RAW Materials Company. ‘RAW materials’ signifies a project of what Kouoh called “raw material human development”, a project that challenges and seeks to replace a state-controlled effort to confine art production and curatorial practice to clearly delineated and impassive cultural boundaries with art that privileges new expressions of human experience in localized communities. Against the backdrop of a recent history in which art institutions have controlled and shaped the art landscape, RAW attempts to reimagine curatorial practice and create a space for sharing knowledge in the form of artistic theory and technical practice. For RAW’s first ever show, Kouoh invited seven African art institutions to “display themselves” in RAW’s new space. 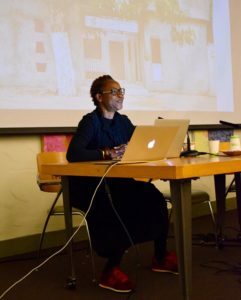 The institutions, and not their art, became the objects displayed and available for critique, opening up a conversation in Dakar about the role art, and specifically curatorial practice, should play within a local artistic ecology. Traditional western methods of curatorial practice have always been linked to market mechanisms and academia, explained Kouoh. Western academic and market control of curatorial practice everywhere, means there is very little space for thinking about artistic practices that are specific to the African continent. Moreover, in recent years, the meaning of the verb “to curate” has now become an umbrella term to signify anything that has to do with a method of selection. Hotels, restaurants, and shopping displays all offer “curated” experiences, which shows how the way the term has come to be commodified, but this sort of practice, Kouoh said, is not befitting to RAW. The etymology of the word “curate” is to care for, she explained, and this definition aligns far better with RAW’s curatorial practice which seeks to protect society and its vitality. RAW Materials Company is part of Art’s Collaboratory, a 25 member organization-network linked by a similar approach to curatorial practice as well as a commitment to societal welfare and vitality. A second collaboratory member, Vìctor Albarracin, Artistic Director at lugar a dudas, reflected on his personal curatorial experience prior to and during his time at the organization. Vìctor Albarracin, Artistic Director at lugar a dudas, reflected on his personal curatorial experience prior to and during his time at the organization. Albarracin noted he was born cross-eyed and by his teenage years had had eye surgery that left him wall-eyed and without accurate depth perception. This personal attribute has led Albarracin to rethink traditional curatorial practices that require an accurate sense of depth, shape, and outline in order to determine the quality of a work of art. A veteran curator of over one hundred small exhibitions at an art space in Bogotá called el Bodegón between 2005 and 2009, he nonetheless insists that the label “curator” is not appropriate for his work. The Global South, the geographical focus of the day’s final panel, is a term that is used by the dominant western world to refer to “uncivilized” people, Albarracin explained.According to him, a “curator” in the Global South is still confined by Western market and academic standards as well as traditional institutional methods of curatorial practice, and still defined by social, political, geographical, and economic divisions out of which the West emerges as superior. In contrast, lugar a dudas, translated in English as “a place of doubt”, is a community oriented art space in Cali Mexico that is a site for exhibitions, music, collaboration, discourse, and art making. Albarracin explained the efforts that have been made to make negotiation and reconfiguration, rather than western standards of authority, a fundamental facet of the organization’s administrative model. The organization has taken big steps toward deinstitutionalization by being attentive to the propositions of others and seeking out communities that might otherwise go unheard and unnoticed.To maintain an organization that exists as a point of resistance against the economic, social, and political pressures of national fascist power, as well as the control of international western superpowers, is an extreme task. But, in the words of Neil Young quoted by Albarracin as he closed, “It’s better to burn out than to fade away”. ARC’s March’s conference Arts as Critique seeks to prompt the question of the relationship between art and criticism from the standpoint of social and political exigencies of our times, and to do so by thinking scholars and curators thinking from and about the global margins and zones of acute transition often called the “Global South”–from Africa, Latin America, South East Asia and the Middle East, to U.S. Latino, African American, Native American and Asian American communities. Arts as Critique is interested in the extent to which contemporary art, art criticism and curating wield a transformative capacity to actively condition or mobilize collective imaginaries and struggles. How do feminist, queer, postcolonial/decolonial, postnational perspectives and interventions call attention to, and reclaim, the political implications of art as critique beyond Eurocentric ramifications? What kinds of (un)belongings and displacement, figured through tropes of gendered, sexualized, ethnicized and racialized vulnerability, could allow us to think (with) the limits and the resistant potential of art? Featuring Vìctor Albarracin, Neda Atanasoski, Natalia Brizuela, Tarek Elhaik, Adriana Johnson, Koyo Kouoh, Anneka Lenssen, Leigh Raiford, Kriss Ravetto, Pedro J. Rolón, Poulomi Saha, and Kalindi Vora.